Did you guess what type of cake this was just by looking at the first photo?! It’s the Australian classic, Chocolate Ripple Cake! 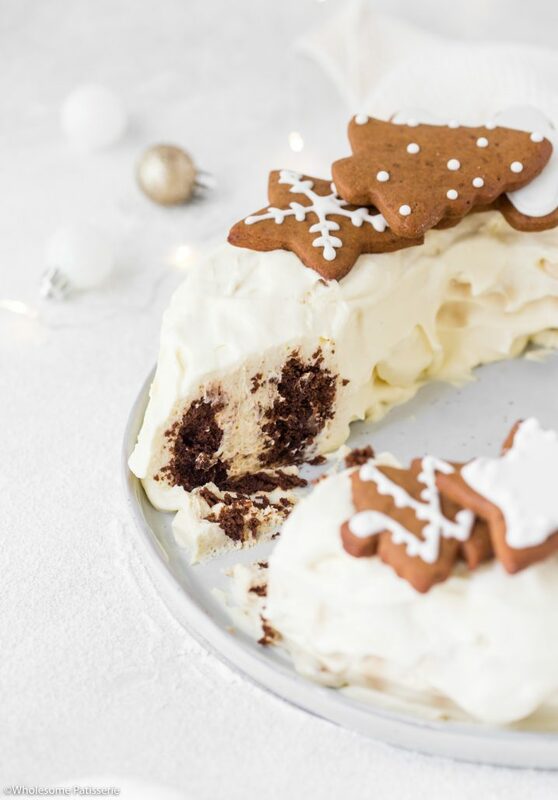 Chocolate ripple cake is an absolute tradition during the Christmas season, especially served on Christmas Day! It’s incredibly simple and one of the best things you will ever ever eat, trust me on this one. What did I do a little differently? I infused brandy into the whipped cream, oh yes, get excited! Chocolate ripple cake must be refrigerated overnight after assembling it as this is when all the magic happens. The chocolate biscuits will slowly soak up the cream and become soft and fluffy, just like the inside of a chocolate cake, seriously, it’s magic! 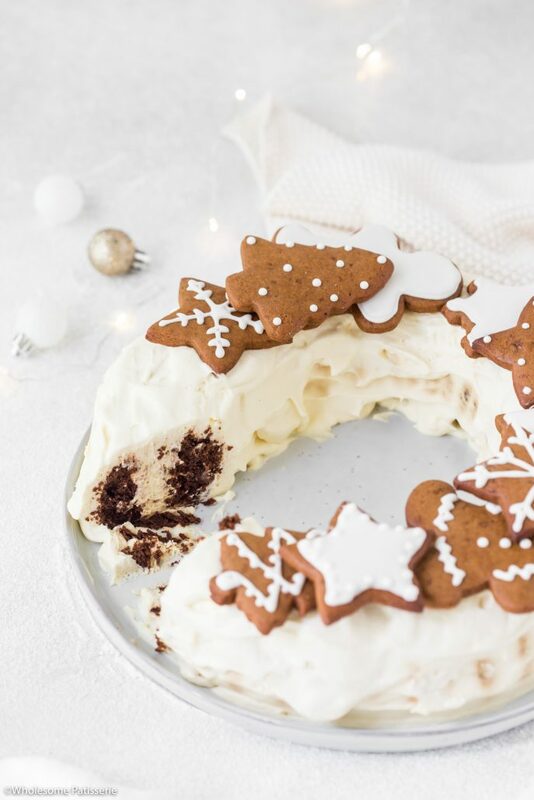 What even more fun is that we created this choc ripple cake into a wreath shape, festive and fun yeah? YES! This way it’s definitely large enough to feed all of your holiday party guests! 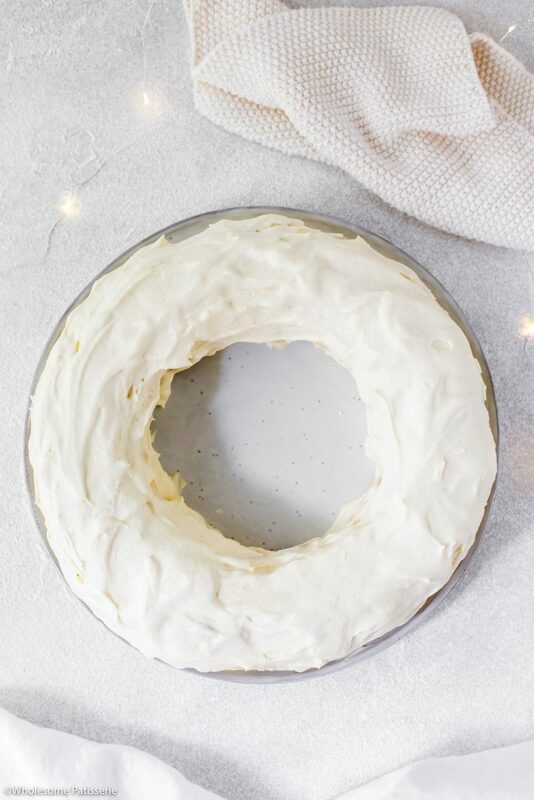 Any sweet delicious thing you desire really, this cake is super versatile! Have I inspired you to create a holiday chocolate ripple cake? It’s one of the easiest and most delicious cakes there is and I hope you enjoy this incredible recipe! In a large mixing bowl, add thickened cream, sugar and vanilla. Using an electric hand beater, beat until just combined. Add in Brandy, 1 tablespoon at a time until desired flavour, I used 4-5 tablespoons. Continue to whip cream on medium-high until firm peaks. 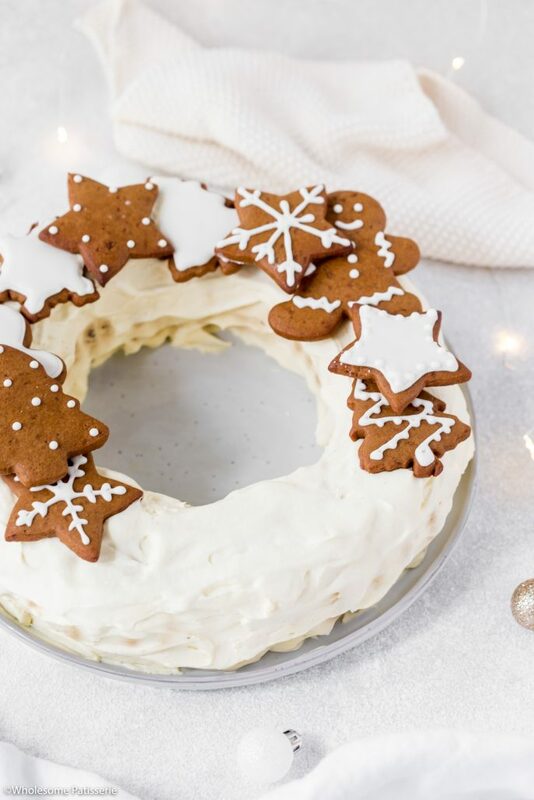 On a large round plate or serving platter, create a large circle by carefully dolloping a little of the whipped cream, to create the round wreath shape. NOTE: following the circular rim of a round plate helps. Pick up 1 biscuit and spread approx. 1 heaped tablespoon of cream onto one side. Stand biscuit upright on it’s edge onto the cream base. Pick up another biscuit and sandwich it against the first biscuit, so the cream is sandwiched in the middle of the 2 biscuits. Pick up a third biscuit, spread 1 heaped tablespoon of cream onto one side and sandwich it against the second biscuit. 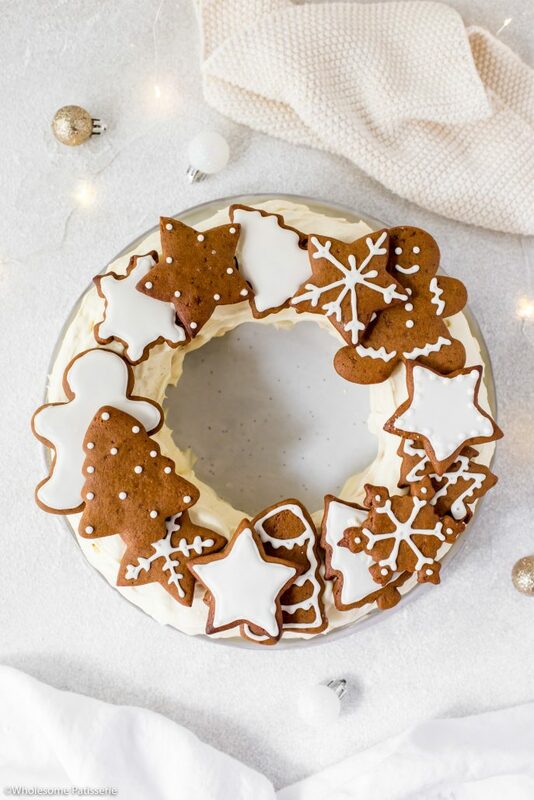 Repeat the above method, moving and sandwiching the biscuits along the circle of cream, creating a large wreath. Use up all biscuits until the 2 ends join and it’s a full circle cake, ensuring there is enough cream leftover to cover the entire cake. Take remaining cream, dollop and spread over the entire cake, to enclose the biscuits in cream. NOTE: if at this point you have ran out of cream, simply whip up some more (enough to cover cake) with the brandy cream ingredients. Once cake is all covered, you can loosely cover it with plastic wrap or leave it uncovered and place it in the refrigerator to set overnight. NOTE: cake must be refrigerated overnight as this time will allow the cream to soak into the biscuits and create a cake-like texture. You can remove it the next day or before serving and dollop more whipped cover the parts where the choc biscuits have soaked through to the surface. 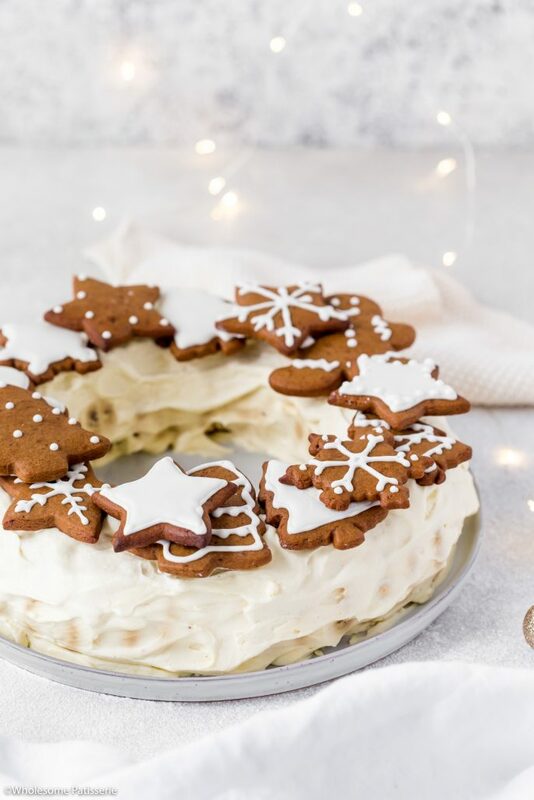 Before serving you can decorate your wreath cake with either gingerbread cookies or fresh fruit such as berries, cherries, kiwi or passionfruit. Store in an airtight container, refrigerated, for 3-4 days. *If you can’t find choc ripple biscuits, I’ve heard Nabisco Famous Chocolate Wafers, also work. 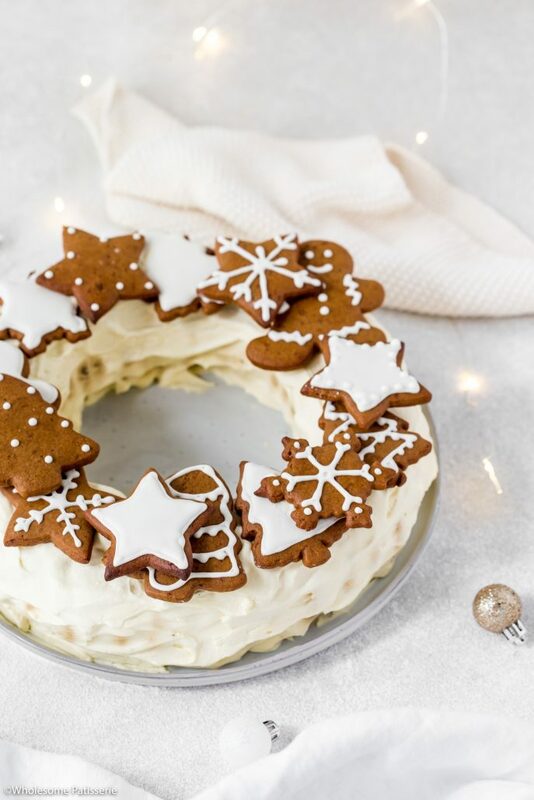 **Use my gingerbread cookie recipe here!